Violent hail storms have undeniably been on the increase in both intensity and frequency around the globe as a direct result of the approaching Planet X, aka Nibiru. Where many of these extreme weather events have been reported on ZetaTalk and the ECAPS ning, an astonishing escalation of insurance claims for hail and wind damage across North America since 2008 further corroborates the Zetas' predictions. Hail-related damage claims for auto insurance more than doubled in 2011 compared to the average filed between 2008 and 2010. By 2012, hail damage had jumped 84 percent from 2010 and constituted the predominant insurance claim across the U.S.
"Insurance claims from hail damage have increased an astounding 84 percent since 2010, according to the National Insurance Crime Bureau. While homeowners filed the greatest number of claims, auto policy claims are rising at the fastest rate, more than six times greater in 2012 than in 2010." Insurance companies in Canada likewise reeled from the dramatic surge of hail damage claims in 2012. In 2013, insurance companies started raising policy premiums, increasing deductibles and even incorporating exclusions for damages caused by hail and wind. Homeowners insurance companies in Kansas filed last year for rate increases that averaged 14.6 percent, with some companies filing for more than 20 percent. And that came on top of an average increase of 6 percent the year before. The companies attribute the increase largely to the high amount of hail, wind and tornado damage claims in recent years that are affecting the rates. “There has been a tremendous amount of wind and hail damage,” said Steve Witmer, spokesman for American Family Insurance. For three of the past four years, Farmers Insurance set new records for claims, said company spokesman Luis Sahagun. Losses in 2011 were an 82 percent jump over the previous worst year. Insurers, hit with a rapidly growing number of claims caused by storms over the past five years, are starting to ask homeowners to pay a separate deductible for wind and hail damage that is higher than they are used to paying for claims. The "Cosmetic Damage Exclusion" for hail and wind damage, excludes payments for damage to exterior surfaces including walls, roofs, doors and windows from hail or wind if the storm impacts the appearance but not the function of these elements. The American Association of Insurance Services (AAIS), an organization that develops policy forms used by more than 700 property and casualty insurance companies, created this new exclusion for insurance companies that have been hit hard by storm losses over the past decade. Since 2008, U.S. insurers have paid 4.5 million hail claims totaling $32.1 billion, according to Verisk Underwriting. Below is a sampling of the more severe hail events that have occurred since 2012. Giant hail stones up to 50 centimeters in diameter weighing 20 pounds fell in Sichuan, terrifying villagers. Students, teachers and staff at Lovett Elementary School in Clinton had to move into the old Eastside Elementary campus after a severe hailstorm shattered windows, destroyed the school’s roof and flooded hallways and classrooms, leaving the building inoperable. The National Weather Service confirmed that the hail in Clinton was the third largest on record to hit the state since records began back in 1950. An intense storm accompanied by strong winds and extreme amounts of hail hit the province of Cordoba, central Argentina on Thursday afternoon, causing extensive infrastructural and agricultural damage. The worst affected were the cities of Rio Tercero, Almafuerte, Berrotaran, Embalse and especially the area around La Cruz. About 70 mm (2.75 inches) of rain was recorded in La Cruz (population 3 000) and an impressive amount of hail, La Nacion reports. "Everything was over in just 15 minutes. More than 1.5 m (4.9 feet) of hail accumulated, leaving route E-21 completely cut." Fire Chief Martin Bustos said meteorologists issued alerts before the storm hit but they 'never' imagined such an impressive phenomenon. Bustos said they worked for hours to free the cars trapped on roads and make the roads passable again. The mayor of La Cruz, Mauricio Jaime, said the city received between 50 and 70 mm (1.96 - 2.75 inches) of rain and added that although the hailstones were not large, the amount was impressive. Franco Cejas, of local FM 98.7, reported that according to a survey carried out in La Cruz, there were four damaged roofs and several affected cars in the urban area. "The worst of the damage was in rural areas surrounding the city," Cejas said. One person was injured in neighboring Embalse. According to La Voz, a woman was driving her motorcycle near Embalse when the storm hit. She took shelter under a tree and got stuck in a large amount of hail. She was eventually rescued and treated for hypothermia. A car and a van were also trapped in hail in the vicinity of La Cruz, Bustos said, adding that it took firefighters almost two hours to rescue them. The storm damaged numerous homes, cars and trees, as well as crops. 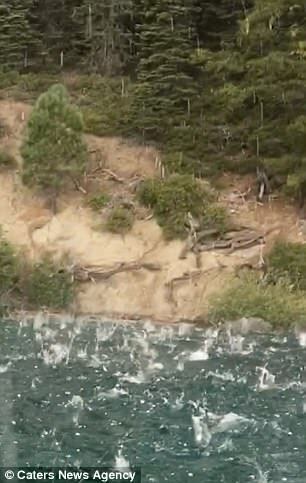 This is the heart-stopping moment a terrified group of wake-boarders were rained down upon by hail stones the size of golf balls, leaving them scrambling for cover. One man shouts out, 'We're under fire! 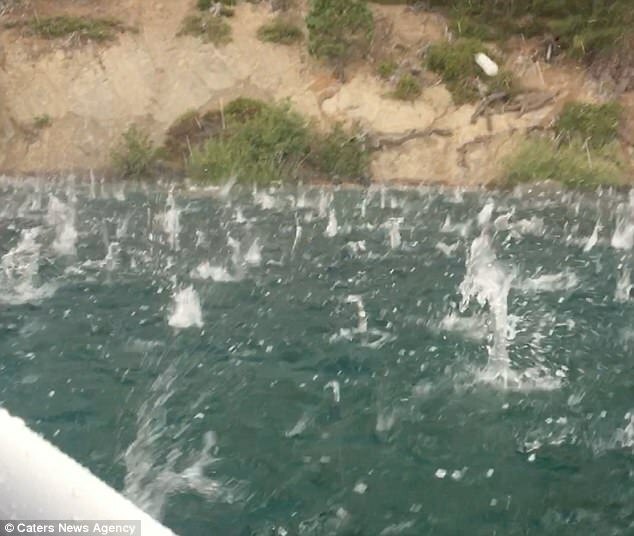 ', as thousands of hail stones splash into the surrounding waters on Lake Tahoe, California. 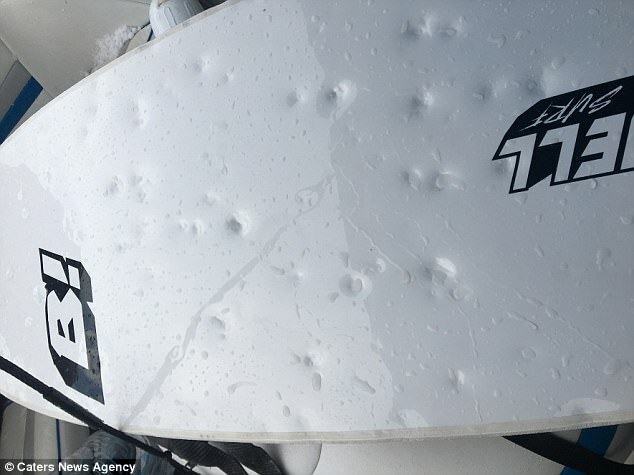 The sheer force of the hail stones was breathtaking, one onlooker said, as they bounced off the boat and left dents in wakeboards. The moment was captured by Trevor Donovan Ricioli, 31, on August 20. Having headed out onto the waters to wake surf, Mr Donovan Ricioli said, the group were soon met with dark clouds. The hail stones started splashing in the waters before they even had a chance to pull anchor. Instead, the group hid and used whatever they had for cover - including seat cushions. Speaker covers were smashed, boards dented, and the hail ripped through the material on the seats. Mr Donovan Ricioli, who lives in South Lake Tahoe, said: 'I was excited and a little scared at the same time. 'It was an amazing display of power from Mother Nature, but, at the same time, we had little shelter and were stuck out in the water. 'There was no way we could have swam, as we would have been knocked out by the hail. The hail was so crazy it was ripping the pine trees apart. "2016 was by far the worst year Texas has ever had on record in hail damage,” Insurance Council of Texas spokesman Mark Hanna said. “We topped the 5 billion mark.. that's worse than any state has ever had." These numbers don’t even include auto damage, which raises the total over a billion dollars. Local repair shops said from what they've seen after recent storms, they expect this year to be even worse. Jason Davis of Davis Dent Repair has been in the business over 20 years, but this year stands out. “We've never actually been this busy since I've been in business,” Jason Davis said. "There's a lot more this year. I mean, a lot more storms hit a lot more cities, which obviously did a lot more localized damage in those areas." Davis has seen customers who came all the way from Denver City and Odessa. More than 150,000 auto insurance claims and 50,000 homeowners claims are estimated to be filed in the wake of a monster hailstorm that pounded Colorado’s Front Range on May 8, putting it on pace to be the state’s most expensive insured catastrophe. The hail storm caused more damage than any other storm in state history, according to the Rocky Mountain Insurance Information Association. They estimate that by the time all claims have been filed, the total will be $1.4 billion. Golf ball - and even baseball-sized - hail damaged homes, cars and businesses along the Front Range during the late afternoon and early evening hours. The largest hail pelted areas west of Denver, including Wheat Ridge, Golden and Lakewood. The storm forced the Colorado Mills mall in Lakewood to close after the mall suffered substantial damage after being pounded by golf ball-size hail and heavy rain. The mall had to be evacuated. Thousands of people continue to deal with insurance and repair shop issues nearly two weeks after the powerful hailstorm punished Colorado. Drivers are still reporting long waits at repair shops as crews feverishly work to get ahead on their workload. Hail are on the rise? ZetaTalk Rights Again? Around ~6000 of 326455 points are not showing on this maps. Around 550 of 326455 points are not showing on this maps. A ferocious hail and rainstorm lashed Harbin City in northeast China, wreaking mayhem on the streets and disrupting traffic. The streets of a Chinese city have been turned into rivers after a ferocious hailstorm left buses and cars submerged and fish flopping on the streets. Cars were smashed by bricks from landslides, and a bus driving determinedly through a flooded street turned white by the hail. Another driver had to abandon his car by crawling through the sun roof, his car marooned in the middle of a flooded street. Fish were also displaced, with scores thrashing for their lives in ankle-deep water in a car park. China has had its heaviest rainfall in 43 years between March and June, which is typically called the flood season. The season has seen an average rainfall of 178 mm nationwide, an increase of 22 percent from last year, according to National Climate Centre. Photos have emerged on social media with images of hundreds of divots on putting surfaces at Hidden Valley Golf Course in Lincoln Nebraska rendering the course practically unplayable. Mike Bossman posted an image of not-yet-melted hailstones fully submerged in the green's surface, many of the icy stones looking to be much larger than a normal golf ball. Andrew Ozaki from local television station KETV also posted an image of some of the hailstones that battered Hidden Valley. “Pretty much every green had damage to it,” said General manager Brad Neunaber. Down the street, the Heartlands Church was also looking at the damage done to their building. “They were baseball and softball size hail. The damage outside is really telling how big these stones were,” said church elder Bill Clark. Their van had broken windows and the inside of the building had water leaking everywhere. Thousands of severe hailstorms pelt the U.S. each year,​ causing, on average, $1 billion in damage to crops and property. The expense is so extreme that a few years ago Texas, eager to find ways to reduce insured losses, declared a war on hail. Mother Nature wasn’t listening. The state has already been pummeled twice this year by major hailstorms, and the season has only just begun. The icy projectiles can puncture roofs, shatter windshields, shred crops and, on rare occasion, take lives. Since 1990, hail has killed 14 people in the U.S. and injured more than 1,000, according to statistics kept by the National Oceanic and Atmospheric Administration. “Hail can cause a lot more damage than a tornado by a large margin if you get one that moves through a metro area,” said Patrick Marsh, a meteorologist with NOAA’s Storm Prediction Center. The storms that battered Fort Worth and Collin County in Texas in March offer proof. The first inflicted an estimated $600 million in damages. The second, a week later, caused an estimated $500 million in damages. Hail, it turns out, is a very hot topic. River of Hail Runs Through Arabian Desert (Nov 10) Extreme conditions have caused deadly havoc in the Middle East over the past fortnight, but a "river of hail" running through the Arabian desert is easily the most surreal in the unprecedented run of freak weather. Footage of the odd phenomenon shot at an unspecified location shows a vast torrent of icy water flowing through the arid desert like a glacier on fast forward after recent hail storms fed into local waterways. Large chunks of ice are visible in the hypnotic stream, and a fellow on camera cheerily puffing a cigarette scoops out a handful of hailstones that would have been at least golf ball-sized when they first hit the earth.